Certified as India’s No. 1 cooking oil, the safe, pure & chemical-free Fortune Soya Health Oil is processed with next generation High Absorbent Refining Technology (H.A.R.T). So your everyday meals not only taste better but also make your bones stronger and your heart & skin healthier. Fortune is India's No. 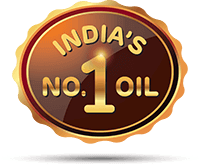 1* edible oil brand. *As per IMRB data MAT Sept.2018 For Soyabean Category. *Adequate exercise and balanced diet which includes balanced healthy cooking oil are key to good health.